Senator from Florida. He has served 9 years in the Senate. 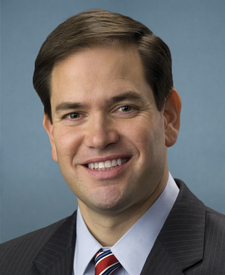 What policy areas does Sen. Rubio focus on, as expressed by his press releases? Learn more. What topics does Sen. Rubio talk about in his recent press releases more often than other members of Congress do? Learn more. What members of Congress use language that is most similar to Sen. Rubio in their recent press releases? Learn more. Tampa Bay Times published an article about Sen. Rubio: Was Bill Nelson vindicated by the Mueller report? He seems to think so. S.1184, a bill sponsored by Sen. Rubio, was read twice and referred to the Committee on Banking, Housing, and Urban Affairs. S.1184: A bill to reform the inspection process of housing assisted by the Department of Housing and Urban Development, and for other purposes. Sen. Rubio released a statement: Rubio, Cramer, Cruz Introduce Resolution Recognizing Israeli-American Contributions to the U.S.